Hello and welcome! I love being and am fortunate to be an orthodontist. Over the years, I have had the opportunity to meet so many wonderful people, and have built valuable friendships with my patients and their families. I have been practicing for 20 years it still never gets old: seeing my patients’ wide, bright smiles when their braces come off. I have a wonderful team that is dedicated to providing the highest quality of treatment, with years of dental experience amongst them. We strive to create a warm and caring atmosphere by attending to the comfort and care of both our patients and parents. I pride myself in providing an informed experience for my families, and I stay current with continuing education so that I can deliver the latest orthodontic treatments and technologies. Originally from the Philippines, I spent time in California and Pennsylvania before moving to Columbus in 1996 and am proud to call it my home. I earned my Doctorate of Dental Surgery at Loma Linda University and Master of Science in orthodontics from the University of Pittsburgh. 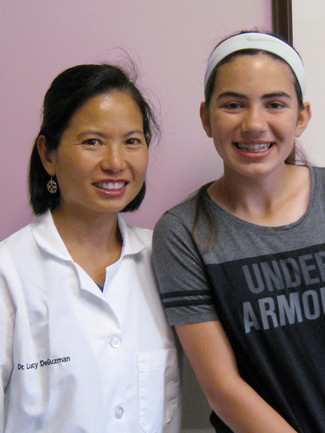 I am an active member of the American Association of Orthodontists and the Great Lakes Association of Orthodontists. In my free time, I spend time with my husband and two children. I like to play tennis, enjoy travelling, and try to grow a vegetable garden.